Ready to make something sugar-free & ultra yummy with honey? In this article, I’m going to show you how substituting honey for sugar is really easy, and how to make sure the honey to sugar conversion OR the sugar to honey conversion doesn’t effect the quality of your desserts and actually improves them. There’s also a chart below that you can refer to in order to figure out the honey substitute ratio. One of our goals is self-sufficiency, and let’s face it: Not only is processed sugar BAD BAD BAD for you, you can’t make it yourself. Honey, on the other hand, you can make with the help of our friends, the honeybees. 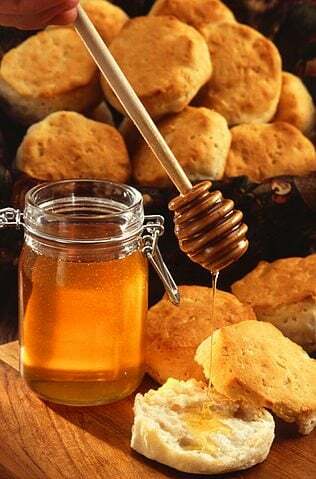 Back in the day, our forefathers (and pretty much everyone in Medieval Europe) used honey to sweeten baked goods (they also used something called cider molasses, which you can read about here). So, it’s a time-tested practice we can also use in modern times. Self-sufficiency aside, after about $10,000 spent on dental work this year, I’ve started to substitute honey for sugar in our favorite recipes, and keeping my fingers crossed that’ll keep me from funding my dentist’s next ski vacation (not that I don’t like my dentist, but I imagine he’d love to see less of me and my smelly muck boots too!). Especially if you keep bees, or plan to keep bees, you’ll want to learn how to substitute honey for sugar so you can use up your harvest. 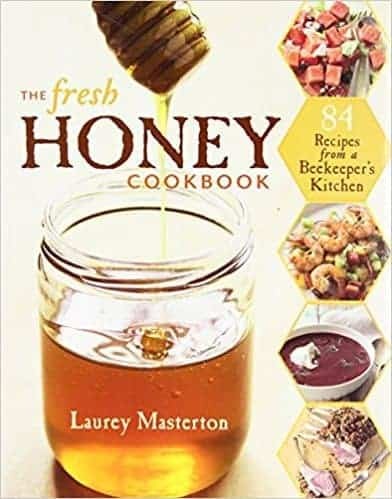 I’ve also included “best practices,” because although you certainly can substitute honey for sugar, it also means you need to take some extra steps to ensure your recipe turns out well. The last thing you want is to bite into the perfect cookie…only to have it be WAY to sweet to enjoy. Honey also has more flavor than sugar, which is great….but it can overwhelm all the other flavors in your baked good. So, you need to use less of it when you substitute honey for sugar. When you substitute honey for sugar, you’re adding more liquid to your recipe, because honey is about 20 percent water. To make up for it, you’ll need to reduce the amount of the OTHER liquids in your recipe. For every 1 cup of sugar you’re substituting, reduce the other liquids by 2 tablespoons. If you’re replacing ½ cup of sugar with honey, then reduce the other liquids by 1 tablespoon. If you’re replacing less than ½ cup of sugar, then you don’t need to reduce the other liquids. Because honey has a higher sugar content (see #1), it cooks quicker and can burn easier than sugar. You’ll need to lower the oven temperature by 25 degrees to make up for it. Be sure to check your baked goods often so you don’t accidentally burn them. Honey is much denser than granulated sugar, so it can easily make your baked goods turn into meaty hockey pucks. Not good. For every cup of honey you use in a recipe, add ¼ teaspoon of baking soda. The baking soda will help your dough rise better. To make life easier, print out this article and keep these honey substitute conversions handy. 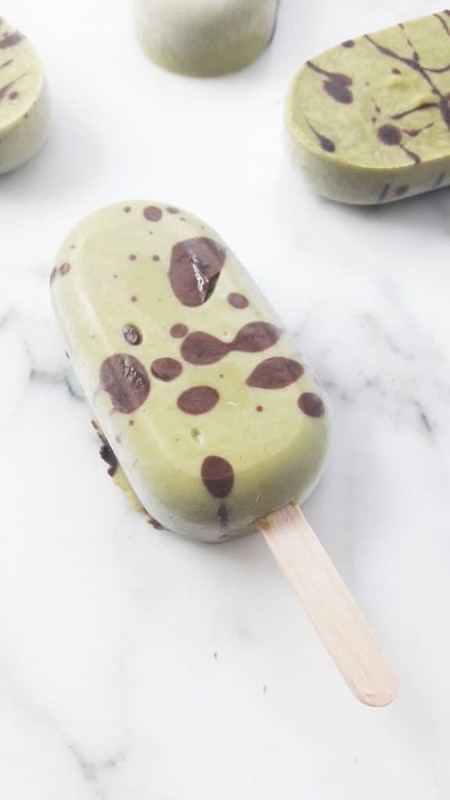 My friends, Alix & Hugo at A Hedgehog in the Kitchen created this incredible sugar-free popsicle featuring honey! Perfect for summertime! 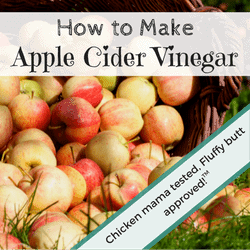 Click here to get the recipe! 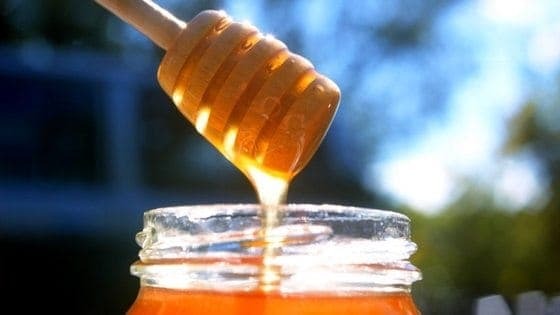 Did you ever wonder “Can I substitute honey for sugar?” If you already are a master at this, what are your best tips? Leave a comment below! Can you use honey as a sub for making jams. Such as blueberry or strawberry/rhubarb. Yes, if you plan to keep the jams in your fridge. When it comes to long term preserving, I only use tested recipes, such as those Ball puts out, and I haven’t tested canning jam made with honey. Hi, I’m new to your blog. Thank you for this sweet conversion guide… I find it very timely as we started raising free-range chickens last year and this summer, bee-keeping (two hives). I was wondering though, my diet is strictly gluten-free because I have Celiac Disease. The flours required for baking in this diet can be tricky in themselves sometime. Would the conversion measures vary for gluten-free baking? I’d love to hear your thoughts. bakeware and also in james. Can you substitute 50% stevia in baked goods without any other conversions, for example having to lower heat or reduce liquids or add additional rising agents? I don’t know – I’ve never tried to substitute with Stevia. My husband likes 2 cups of sugar in his 1 gallon jug of look aid and/ or tea. If I substitute honey will it still taste the same?